Some historians claim, but never proven to be true, that the name “sundae” was created in response to the “Blue Laws” which said that ice cream sodas could not be sold on Sundays because they were to “frilly.” For some reason the “righteous” very much against what they called “sucking soda” (especially on the Sabbath and the clergy started preaching against them). The dish has gone by other names at various time, most notably “sundi” and “sondhi.” Some accounts have explained all these names as attempts to avoid offending the sensibilities of the devoutly religious, which might take a dim view of a pile of ice cream and syrup being named after the Sabbath. The biggest rivalry is between Two Rivers, Wisconsin and Ithaca, New York. This dispute dates back from the 1970s with letters and barbs between the mayors of these cities. This is definitely serious business and a matter of pride for these towns. The two cities have sparred in a good-natured “Sundae War” for several decades. H. L. Mencken (1880-1956), famed newspaper columnist, political commentator, and essayist, in his 1945 book, The American Language: Supplement 1, while writing on the suffix “DAE” as in sundae, wrote that the “most plausible of their theories ascribes the introduction of the ‘sundae’ itself to George Hallauer of Marshall, Illinois, and the invention of its name to George Giffy of Manitowoc, Wisconsin.” Mencken version was so well received that some sources still cite it as a possible etymological source for the word “sundae.” Mencken claimed Wisconsin sundae origins predated all others. Mencken’s name and the plausibility of his stories have kept them alive, and still believed by many, to this day. Mencken was just reporting something that had been told in Two Rivers (and elsewhere) for decades prior to his book. True or False? Author Michael Turback, who wrote A Month of Sundaes: Ithaca’s Gift to the World and More Than a Month of Sundae, says the Two Rivers story, as well as one about Manitowoc, were bandied about by the late journalist H. L. Mencken, who reported on the matter in the first volume of “The American Language,” published in 1919, but later admitted it was a hoax. He just said Mencken was known for pulling hoaxes. 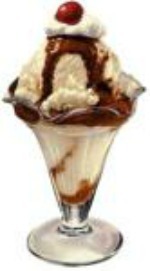 Two Rivers, Wisconsin claims that the first ice cream sundae was served by accident in 1881. Druggist Edward Berners (1863-1939), owner of Ed Berners’ Ice Cream Parlor was asked by a George Hallauer asked for a ice cream soda. Because it was Sunday, the Sabbath, Mr. Berners compromised and put ice cream in a dish and poured the chocolate syrup on top (chocolate syrup was only used for making flavored ice cream sodas at the time). Ed Berners sampled the dish and liked it enough to begin featuring “ice cream with syrup” in his shop for the same price as a dish of ice cream. This ice cream concoction cost a nickel, and soon everybody wanted some. “One night, Hallauer dropped in and ordered a dish of ice cream. As I was serving it, he spied a bottle of chocolate syrup on the back bar, which I used for making sodas. ‘Why don’t you put some of that chocolate on the ice cream? '” he asked. Fond du Lac, wis – (AP) – E. C. Berner, 76, of Two Rivers, who claimed to be the originator of the ice cream sundae, died Saturday at the home of a sister, Mrs. Albert Pilon, where he had lived for the last two months. Edward Berners closed his ice cream parlor in 1927. Today, the Washington House Hotel Museum in Two Rivers includes a replica of Ed Berner’s ice cream parlor. Be it further resolved that copies of this resolution be forwarded forthwith to Mayor Carolyn Peterson and the Common Council of the City of Ithaca, as well as to the board and staff of the Ithaca/Tompkins County Visitor and Convention Bureau, to advise them of the folly of their endeavor, along with sincere best wishes from the citizens of “The Coolest City in Wisconsin”—and Birthplace of the Ice Cream Sundae—Two Rivers. Ithaca, New York also claims to be the birthplace of the ice cream sundae in 1892. Reportedly, Sunday afternoon, April 3,1892, after services at the Unitarian Church, Reverend John M. Scott paid his usual visit to the Platt & Colt Pharmacy in downtown Ithaca. Shop proprietor, Chester C. Platt (1869-1934), was church treasurer and he met often with Scott for conversation after services. Seeking refreshment for himself and the reverend, Platt asked his fountain clerk, DeForest Christiance, for two bowls of ice cream. But instead of serving the reverend plain vanilla, Platt took the bowls and topped each with cherry syrup and a candied cherry. The finished dish looked delightful and tasted delicious — so much so that the men felt obliged to name the new creation. After some debate, Scott suggested that it be named for the day it was created. Platt concurred and the first “Cherry Sunday”was born. Ithaca has extensive documentation supporting the sundae’s creation in its’ town in 1892. The information is so specific, the city can almost pinpoint the exact hour the first ice cream “Sunday” was served. While other cities may claim the sundae, none can support its claim with primary evidence. This gives Ithaca title to the first documented ice cream sundae in the United States. Discovered in 2007 in the archives of Cornell University’s Kroch Library, the original ledger books from the Platt & Colt pharmacy prove that Chester Platt was indeed selling ice cream in the early 1890s and had the necessary supplies on hand to create the first sundae. The ledgers also confirm DeForest Christiance’s claim that he was an employee of Platt & Colt when the sundae was created. NOTE: When going through Platt & Colt’s ledger books, the researchers found that Deforest Christiance got a raise two weeks after they started selling sundaes. His salary went from $2 week to $4.50. Christiance must have saved his money. He eventually bought the business and ran it through the 1920s. 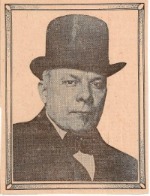 Chester Platt moved into politics and became a reformer in the NY Democratic Party. He later became a newspaper editor. In the 1930s, perhaps as a respite from other Depression-era news, numerous newspaper articles appeared debating the origins of the sundae. Former Platt & Colt shop clerk DeForest Christiance weighed in on the national debate with this letter to the city’s resident historian, John Brooks. This document, rediscovered in 2007 in the Archives of The History Center in Tompkins County, forms the basis of Ithaca’s story. It’s a colorful tale, but without corroborating evidence, it’s hardly definitive. Discovered in 2007 in the archives of Cornell University’s Kroch Library, this letter confirms that Platt & Colt’s ice cream “Sunday” dates to at least 1894 and by that time, had gained enough popularity for its creators to seek trademark protection. The attempt proved fruitless, federal trademark protection didn’t extend to domestic commerce at the time. Interesting to note, attorney Henderson didn’t indicate any familiarity with the notion of an ice cream sundae. But within 10 years, sundaes would be served at soda fountains nationwide. What would a sundae be without the tradition Maraschino Cherry? Learn about the history of the maraschino cherry. Also maraschino cherry myths and facts. 1880s: Historical Event/Fact, by Tamara K. Gross. A Month of Sundaes: Ithaca’s Gift to the World, by Michael Turback, Red Rock Press, New York, NY, 2002. – Official Website of the Ice Cream Sundae. Bruce Stoff, Marketing Communications Manager, Ithaca/Tompkins Convention & Visitors Bureau. Chocolate, Strawberry, and Vanilla: A History of American Ice Cream, by Ann Cooper Funderburg, published by Bowling Green State University Popular Press, 1995. Greek Trivia: Sweetness and Lies. History of the Ice Cream Sundae, by Mr. Richard Lloyd Jones, Tulsa Tribune, Evanston Public Library. Meredith Buchberg and Laura Willemsen, Corson Fellow interns at The History Center in Tompkins county in 2007. Official website of the Ice Cream Sundae. Sundae Best: A History of Soda Fountains, by Anne Funderburg, Popular Press, an imprint of University of Wisconsin Press, 2003. Two Rivers Historical Society, The REAL Birthplace of the Ice Cream Sundae. Welcome to Ithaca, Home of the Ice Cream Sundae. Copies of the original documents presented here are on display for public review at the History Center in Tompkins County.